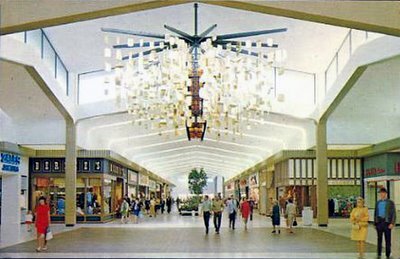 I really love this photo of the Southcenter Mall (originally South Center, two words)--only wish I had a better version to share, as this one's sorely lacking (I'll add it to my list of "needed upgrades", and keep my eyes peeled for another one so I can do a proper repost sometime). Still, I think we can manage to get the idea here anyway, which is that it's a great shot and a great looking mall (was back then at least)! You can see in this picture one of their beautiful illuminated sculpture chandeliers (I think they had two). According to their website, Southcenter's currently undergoing a major expansion. Wow, truly an outstanding photo! Light, bright, and a brilliant... chandelier-type thing (?) Whatever, I love it regardless! What a great looking mall! The people are dressed nicely too. What ever happened with that? I checked the current website. Why are all the Westfield web sites so bland? Who knows! I guess it's your typical corporate decision that they all need to be the same thing than for the malls individually to have webpages designed more locally. An extraordinary transformation is underway at Westfield Southcenter. We're adding an additional 400,000 square feet of retail, as well as a brilliant three-story atrium, six signature restaurants, two covered parking structures and a state-of-the-art 16-screen AMC theatre. The three level expansion will feature a dining terrace on the second level with plush fireside seating and views of Mt. Rainier through an awe-inspiring 90-foot glass facade. This expansion will add 75 specialty stores, opening in 2008. Store names will be released periodically -- check back for updates! With the exception of the 3-story atrium, this is almost close to how Westfield expanded Franklin Park in Toledo to offer 2 parking structures (not to mention a rooftop parking lot above the new wing), a 16-screen National Amusements theater, a new food court with a built-in fireplace and a dozen more shops or so when that was completed last year. More of the same for Westfield Valley Fair! It's only a shame that hardly any mall in Toledo has never had a 2-3 story struture like in other American cities, so we never got to shop on multiple floors like they did elsewhere, we had the normal one-floor structures for the past few decades. Knowone just never bothered to develope a plan outside of blueprints for such a mammoth at all, and now with "lifestyle centers" and other subdivisions taking over, it just seems pointless today. There's something really spectaular about this photo. The combination of the chandelier and the gabled corridors is beautiful. I must comment on this. Southcenter is, and has always been, my home mall. The architecture, with those Gothic-arch hallways, rocks. The hallways and this 4-way atrium are still there. So is the decorative trim above the stores, though it is now white rather than metallic pale gold. Gone are the planters... the fountains (one bronze sculptural fountain and one oval spray ring in a huge oval bowl) and, of course, the chandeliers. The huge brace that held this one is still there. This chandelier had three or four tapered, boxlike sections stacked, with spaces between, on a long pole. They had dark bronze frames and amber glass or mica panels with dim lights inside. The spangles were big, round-edges squares of reflective metal with a sort of pale gold-green irridescence, and they turned slowly in air currents since the chains were connected by pieces of thin cord. All that hangs here now is a huge neon "Food Court" sign on the right, pointing down that hallway which, at the time this shot was taken, ended instead in a drugstore and a supermarket! The one other chandelier was at the far end, by Frederick & Nelson (now Sears) above the oval fountain, and my memories of it are very vague but I think it may have been a sort of cascade of long glass rods tipped with glass flowers (you know the type, sold in 80s Sears catalogs - but much bigger) Anyone who locates photos of the Southcenter fountains or the other chandelier (the bronze fountain was in the "columnarium" out front, or so this blog says it was once called) gets big points from me for rekindling fond memories - I adored mall decor as a child! The Zales (Jewelers) on the left is still there, one of only two non-anchor stores that opened when the mall did and still claim their original locations. They may be the only two non-anchors left from the start period, original location or not. The other, down the hall to the left, is the Tinder Box tobacconist that helped me begin my fascination with collecting pipes as a kid. That stays with me to this day and I still shop there, but sadly the dark "Olde English Tobacconist" decor is long gone - it was here, too, that I saw my first lava lamps, a collection I continue to add to. Ahh, memories of malls. 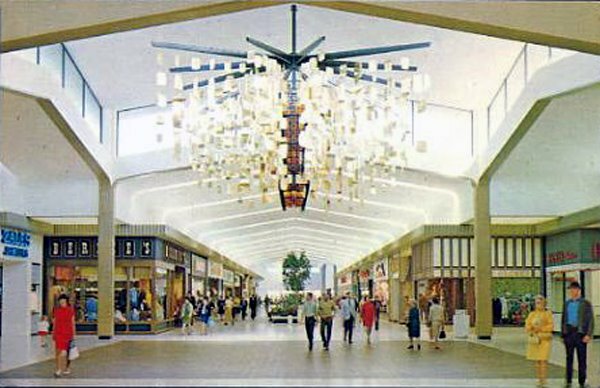 The first photo is looking northward -- the photographer is standing in the corridor that leads to the present-day food court (and at the time, led to a Thriftway, later Lucky, supermarket and a PayLess drug store). Richardson's Apparel is in the left foreground and, across the aisle, Paris Hats is in the left background. At the right of the photo, where the woman is looking slightly downward, is Heidi's Chocolates. You can see one of the display cases behind her. The second photo is looking eastward. The photographer is standing where the square Pacific Northwest Bell sign is in the first photo. I'm pretty sure that this picture is older. Note that Zale's Jewelers (the company spelled it with an apostrophe back then) and Bernie's Menswear are positioned together in the same corner spot in both Southcenter and Tacoma malls. The corridor leading to present-day food court is at right. Awhile back someone posted links to at a sign company's Web site of installations they did at the Tacoma Mall several years ago... anyway, the Food Court sign in one of those pictures is over the top of the corridor you see on the right. There's a Starbucks at that corner position now. Unlike Southcenter, Zales is now at a different location in the Tacoma Mall. Friedlander's Jewelers is the only original non-anchor tenant that's never moved to a different space. It's located across from The Bon/Macy's in the Columnarium. Speaking of which, that area of the mall is getting some cheap-looking retrofits between some of the columns in an effort to make them look like arches. They are absolutely hideous and appear to be white-painted boards cut in an arch shape and bolted to the columns. Some of them have huge advertisements plastered on them. Not all of the columns have received this treatment, however. Also, scaffolding has just gone up in the east concourse... I hope they are not in the process of installing a drop ceiling that would obscure the beautiful curvature of the ceiling and distinctive skylights that you see in the corridors behind the atrium in these pictures. All this seems to be leading up to the renovations next year once Mervyn's vacates and Nordstrom builds a new store at that location. A strip of lifestyle shops is going to go in the current Nordstrom space. Simon in Tacoma has been much more than Westfield at Southcenter tight-lipped about their specific remodeling plans, besides releasing a couple of artist's renditions to the media. Hopefully, the "Simon-izing" process won't be too destructive. Graham & Co. knew what they were doing when they designed these two malls -- down to the minute details. The "frames" above the storefronts that Jonas mentioned actually hides a fire-sprinkler system. The receiving area and dumpsters at the Tacoma Mall are hidden by a long rock wall. They were designed as beautiful, pleasant buildings to just spend time in. I don't think developers are interested in creating that feel anymore... it doesn't directly translate to more sales in their eyes. They don't want shoppers to spend time looking up at chandeliers or skylights... you're not looking at the storefronts when you do that. I'm not familiar enough with Southcenter to be able to comment on the fountains and fixtures there. As far as the designer of the fountain next to the Tacoma Bon stairwell, I've never seen anything about the mall's fountains in the newspaper articles from the time of the grand opening. (Here's a photo, though: http://search.tacomapubliclibrary.org/buildings/bldgdetails.asp?id=BU-13478&vhash=T&i=18) I'm going to try getting my hands on a book about Tsutakawa that was published in 1990 that contains photographs of a number of his works -- it's possible that it also has a list of all his installations. In the Tacoma area, I do know of one Tsutakawa still on display in front of the Lakewood branch of Washington Mutual on Gravelly Lake Drive. That fountain was originally in the courtyard of the Pacific First Federal Savings Bank (WaMu's predecessor) in Downtown Tacoma and was moved to Lakewood when that branch opened. I have the book to which you refer. The fountain, it is said, made for Southcenter and stolen before the mall's opening (replaced by a Billingsley, who did two fountains in Tacoma Mall) and the small Tsutakawa, current location unknown, in Tacoma's Bon Marche's Cascade Room courtyard, is not listed either. Is there a woman in the world who does not love jewelry? It is not always possible to afford expensive jewelry items but even those that are cheap can still look good. Zales Jewelers is a retailer of fine jewelry. I learned about it from www.pissedconsumer.com. It is a great site for you to learn about the company, its products, as well as customer feed backs. The mall opened when I was six. I remember thinking that I would never have to go downtown shopping every again. I just hated the 20 minute search for a parking meter, the 8 story downtown dep't store, and walking the many blocks between stores. I was so excited and had birthday parties at Farrell's. Does anyone remember the restaurant that occupied the space in the front corner of Penney's (I think there was one at Northgate and Tacoma Mall as well.). I loved that restaurant, which catered primarily to kids with paper and crayons to draw pictures while waiting for your food. IIRC, Zales moved into/besides Bernie's location in that photo. That white storefront is now a shoe store? or perhaps the store with all the tiaras and such in it? At the very edge of the Bernie's corner is a Sunglass Hut (well, was in '05ish)...I think Zales was just behind it. Nice place to spend a lot of time, either way. I moved away and there's no Nordstrom here! Boo.